As a colour scheme for a formal event clean green tones always look splendid. Natural greens with a splash of white in the form of elegant November lilies and anthuriums balance the theme for these structured church flowers. We designed four flatback arrangements for the front of the church at Baulkham Hills (two large and two extra large statement pieces in ceramic vessels) which radiate crisp lime. You need to imagine the lilies are open! We made these with very fresh lilies so they would be beautiful for the days to come as they opened. The trouble with delivering opened lilies to clients in Baulkham Hills means that open petals bruise easily in transit and set-up. And the recipients don't get to enjoy the full life of the lilies if they are already open. Jules also made a beautiful lectern arrangement. Because this particular event ran over a four day period we chose longer lasting flowers and in-bud lilies so they would gradually open up over the course of the event. All that was required was a gentle watering into the oasis floral foam each evening. This church event held at The Church of Jesus Christ of Latter-Day Saints, Watkins Road, Baulkham Hills. 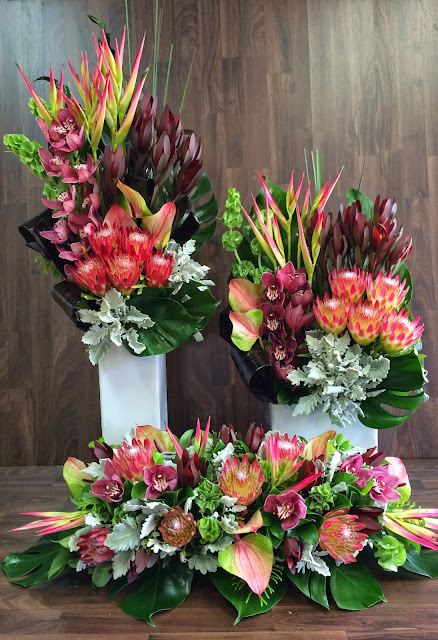 We've also created other flowers for this venue, such as these beautiful long-lasting native flower arrangements.